The Machine Tool Technology Program offers students the opportunity to experience the latest technology in the Machine Tool Industry. Our students receive extensive training through hands-on experience, which simulates operations used in the industry. Metal parts are produced through the	use	of	lathes,	milling	machines,	surface	grinders,	Computerized	Numerical	Control	(C.N.C)	Milling	machines,	and	CNC	Lathes. CTEi’s	dual	program	with	our CAD class offers our students the opportunity to learn the design stage of projects. 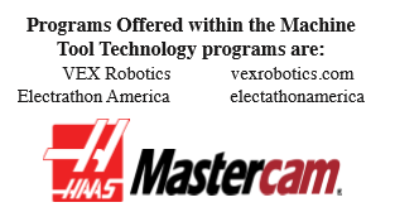 Graduates can gain employment as machinists, tool and die makers, entry level,	welders,	inspectors	and	computer	numerical	control	(CNC)	programmers/ operators. For those students wishing to go to a higher education, opportunities include Mechanical Engineering, Manufacturing Engineering and Industrial Engineering. CTEi’s articulation	agreements	with	Quinsigamond	Community	College	and	New	Hampshire	Technical Institute help students transition to college with credits offered upon completion of the CTEi’s Machine Tool Technology Program and enrollment in a degree program at their institution. Basic Machining. Basic Blueprint Reading.